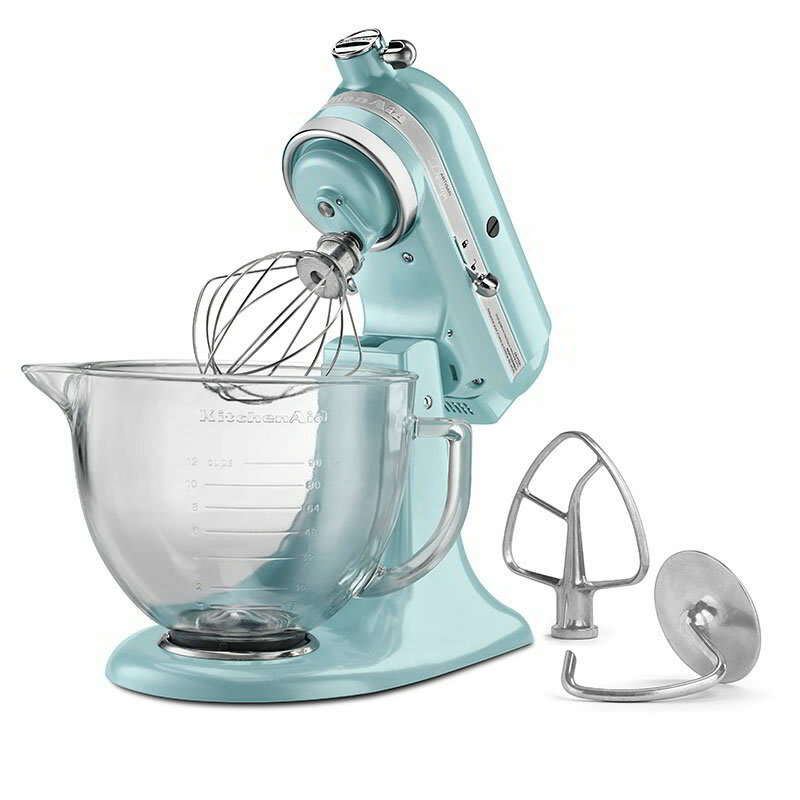 This KSM155GBAZ stand mixer from KitchenAid's Artisan Design series comes in a premium metallic finish in Azure Blue. This unique color will add style to any kitchen, while the 5-quart glass bowl is capable of yielding up to 9 dozen cookies or 4½ loaves of bread in one batch and includes measurement markings and a pouring spout that will make mixing a simpler process. Plus, this KitchenAid stand mixer comes with a 10-speed function so that you can stir, mix, beat, knead, or whip at the perfect speed, and the tilt-head design makes it easy to add ingredients, access the product, and attach or remove the bowl. Artisan® Design Series 5-quart mixer, 10 speed, tilt back head for easy access to mixture, 59 point planetary mixing action, attachment hub, includes burnished flat beater, burnished C-dough hook, 6-wire whip, glass mixing bowl. 325 watts, 120v/60/1ph, Blue Azure. Warranty not valid when used in commercial environment.